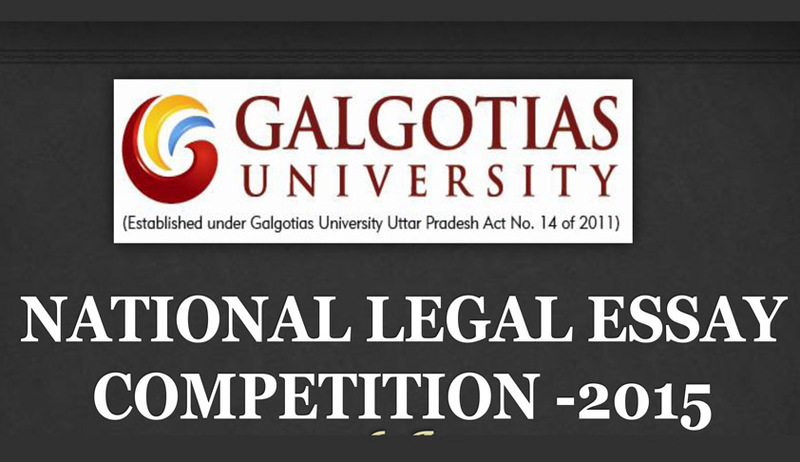 School of Law, Galgotias University is organizing the National Legal Essay Competition which aims to provide a platform to the students enrolled in law schools and colleges all over the country to express their views on topics based on different avenues of the legal field. Eligibility: The competition shall be open to all students OF UNDERGRADUATE AND POST-GRADUATE from any institution recognized by the Bar Council of India, in India. Attempt to suicide should or should not be punishable. Does the National Judicial Appointments Commission Act ensure independence of Indian Judiciary? Limited Liability Partnership: Balance between partnership and company. Women in Board of Directors: Breaking the Glass or meeting statutory provisions Judicial Activism: Destroying the Human Rights jurisprudence? Line spacing: Double spacing with ‘0 pts.’ before and after. Co-authorship to a maximum of 2 individual authors is permitted. The soft copy of the essay should be submitted in MS Word file (.doc). Click here to download the brochure for more details.